Oh. My. God. I’ve just been given the location of the largest stash of Golden Age Hollywood jewelry in the world. 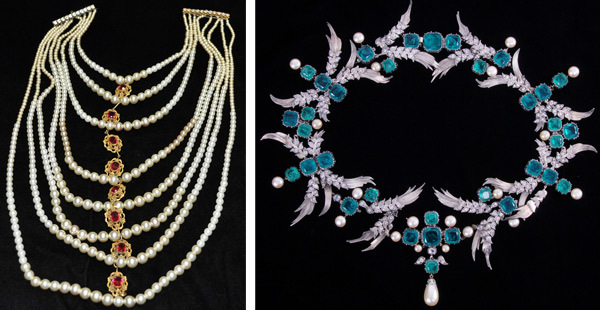 Worn by stars like Marilyn Monroe, Elizabeth Taylor, Grace Kelly, and Greta Garbo, thousands of gems have apparently been gathering dust in an unmarked warehouse, unmolested for half a century. It sounds too good to be true. What are the chances, I wonder, that the treasures are still there? Wouldn’t they be in the world’s biggest museums by now? Worn by the stars’ great-granddaughters? Divided up and sold at auction? I have to see for myself, so I book a flight to L.A. Here’s my story. This entrance doesn’t do justice to the treasures found inside. As the cab drops me off deep in industrial land, I wonder if I’m in the right place. 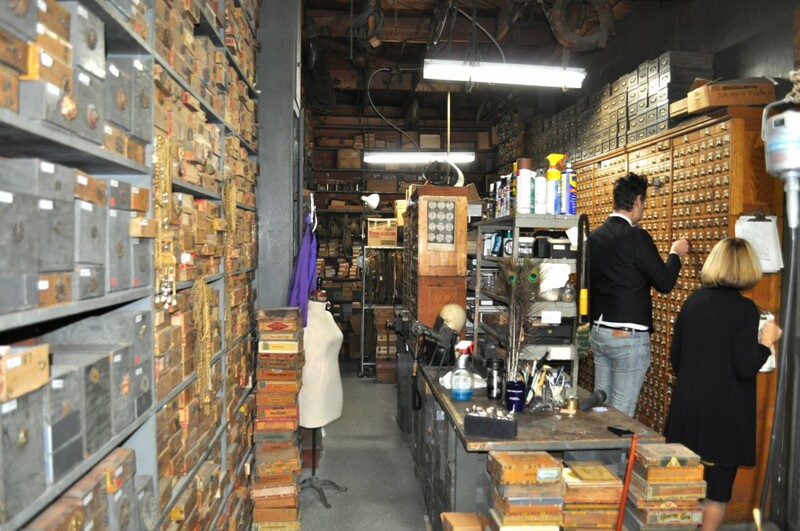 This is purportedly the longtime studio of Joseff of Hollywood, jewelry maker to the biggest Golden Era movie stars. Could this really be it? From the outside, it looks like any other drab warehouse. Then, I notice the weathered door and spy the metal lettering bearing the signature “Joseff” logo. There’s no doorbell, so I knock. Tina Joseff, the daughter-in-law of company founder Eugene Joseff, greets me at the door with a hug. An old-fashioned chime sounds as I step into the lobby. The humble gray entry only hints at the treasures inside: Movie stills hang in frames. To me, it feels as though nothing has changed since 1940. We explore Joseff’s original workshop. Click image for a larger view. Tina leads me to the studio, and—whoa! The tiny space, maybe 100 square feet, is entirely painted a startling turquoise blue. A crowned Buddhist-inspired god of jewels welcomes me from the back-wall mural, where he is portrayed dusting the sky with stars (real Swarovski crystals). Another wall is lined with bright blue drawers, topped with golden and bejeweled crowns, tiaras, scepters, and armor, some of which peep out of pirate’s chests. As I walk onto the faded palm-tree carpet, it dawns on me that I am entering a truly magical space. 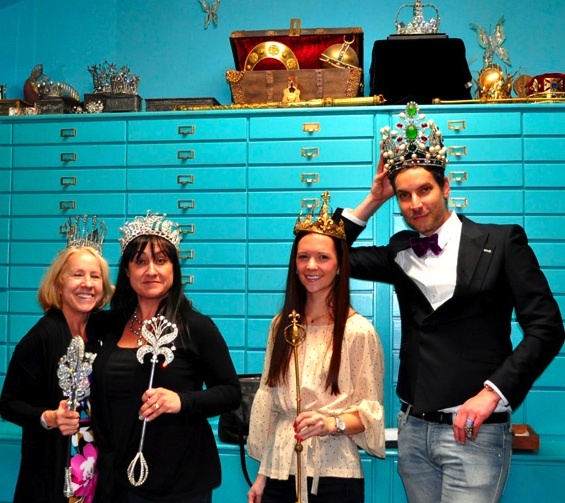 Michele (left) and Tina Joseff in front of trays housing thousands of famous jewelry pieces. Tina’s daughter, Michele, and her assistant, Dawn, meet us there, and soon we are joined by Cameron Silver, co-owner of the famous L.A. vintage shop, Decades Inc. I don’t know why I am surprised the studio is so small; jewelry doesn’t take up a lot of space. 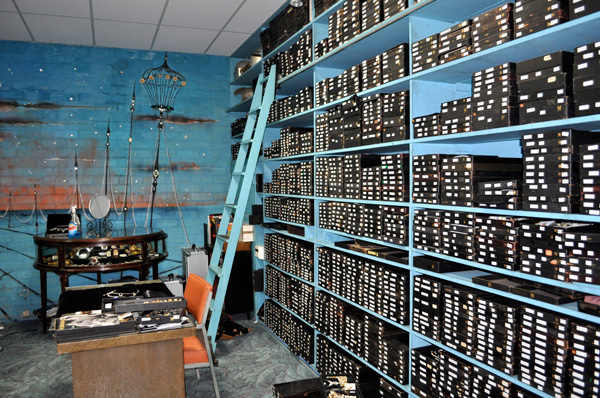 Here, thousands of pieces of Hollywood history are crammed into drawers and trays. Open up one blue drawer, and you might find snakes; another could be all bejeweled daggers. The opposite wall is stacked floor to ceiling with black velvet-lined trays. 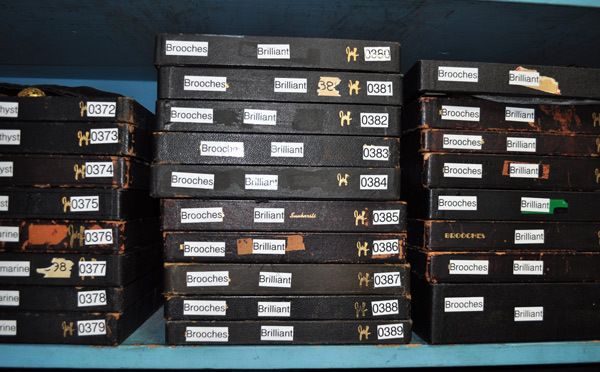 This is where the most coveted pieces have been carefully catalogued, ordered first by type, and then by gem color. With all the pieces of history around me, I feel completely overwhelmed. I don’t know where to start or what to ask to see, but Tina and Michele know where to begin. 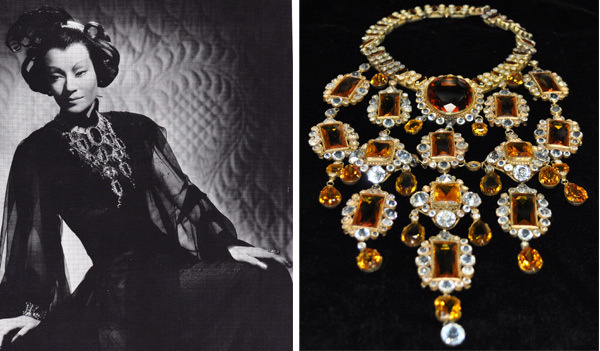 They take out the breathtaking “topaz” bib necklace first worn by Ona Munson in 1941’s “Shangai Gesture.” Dubbed “the most spectacular necklace in the world,” this “wow” piece has appeared in more movies than any piece in the whole collection. I can see why. I can’t take my eyes off it. The crown jewels of Hollywood, including the snake bracelets worn by Rita Hayworth in 1947’s “Down to Earth,” the leaf brooch worn by Jean Harlow in 1936’s “Libeled Lady,” and the bird bracelets worn in 1944’s “Desert Hawk.” Click on the image to take a closer look. The reason this stuff is all here, I think to myself, is a testament to Joseff’s business savvy. Instead of letting the studios keep the best pieces, he held on to them and rented them over and over across the decades. Moreover, since it is “only” costume jewelry, it wasn’t regarded as particularly valuable until very recently. 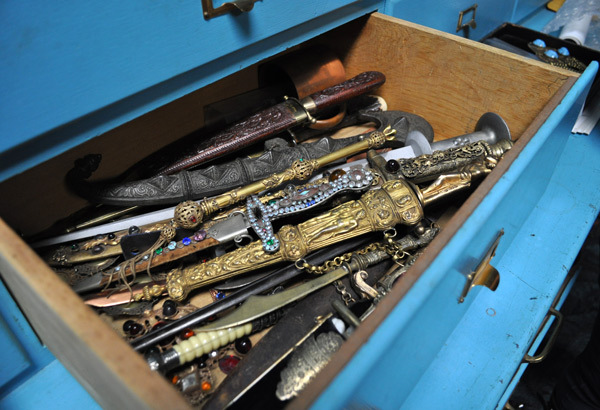 Open one of the turquoise blue drawers at the Joseff studio, and you might find bejeweled daggers. I want to absorb everything, to drink it all in. This is my only chance to see all these glimmering bits of history and hear the stories straight from the mouths of the family. Tina and Michele bring me back to earth, offering to let me have a closer look at items in the case. They even let me try a couple of pieces on, including the snake bracelets worn by Rita Hayworth when she played a goddess in 1947’s “Down to Earth.” Right away, I can tell those were definitely made for tiny wrists, as I can barely get them on. 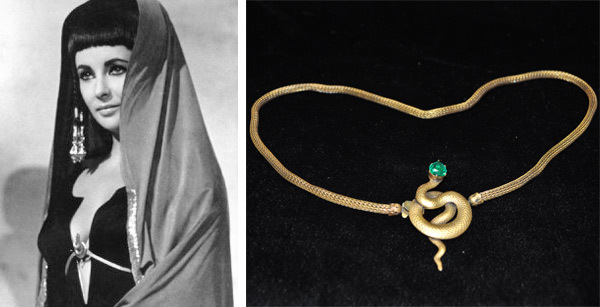 Next, I take a closer look at the snake belt famously worn by Liz Taylor in 1963’s “Cleopatra.” Tina explains that Joseff and his wife and business partner, Joan Castle Joseff, worked mostly with the costume designers. But at times, they got to fit the stars directly, as with this belt. Elizabeth Taylor insisted that this Joseff of Hollwood snake belt, which she wore in 1963’s “Cleopatra,” had been measured wrong. It now lives in the glass display with other Joseff treasures. “Joan had gone out to the studios and measured Liz Taylor for a belt for one of the costumes,” Tina recalls. “By the time the belt was created and she took it back for the fitting, it was about 2 1/2 inches too small. Liz Taylor was known for her fluctuating weight back then. But she blamed it on Joan and said that Joan had not measured her correctly. Of course, Joan didn’t argue with her, but she told me, ‘I know I measured right.’ The rule is measure twice, cut once, and Joan was very thorough. 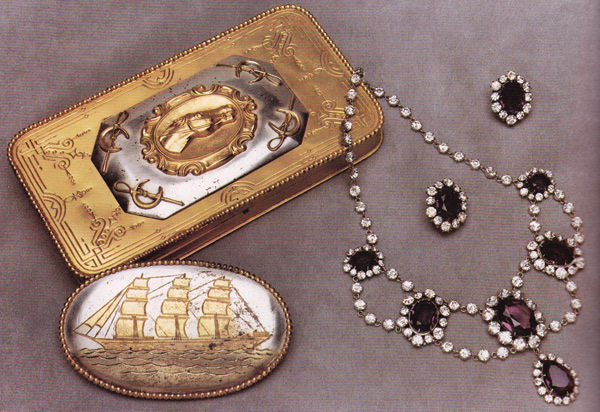 Going back to the black velvet trays, Tina and Michele bring out a tremendous necklace, worn by Bette Davis in 1939’s “The Private Lives of Elizabeth and Essex” and the manly Tyrone Power in 1939’s “The Rains Came,” which may be my favorite thing I’ve seen so far. It has nine long strands of faux-pearls, connected down the middle by crystals set in Joseff’s trademark golden-plated filigree. It’s just so classy, and with a backless gown, it could definitely be red-carpet worthy. I start to wonder: If today’s stars knew about Joseff of Hollywood, would they dare wear it in the spotlight? With all the pieces of history around me, I feel completely overwhelmed. One thing I don’t see was the single pearl drop Errol Flynn wore in “The Adventures of Don Juan.” Top costume jewelry expert and antique book publisher Judith Miller had told me a particularly amusing story Joan Castle Joseff relayed to her about Flynn, who was rumored to be gay, and this particular earring. 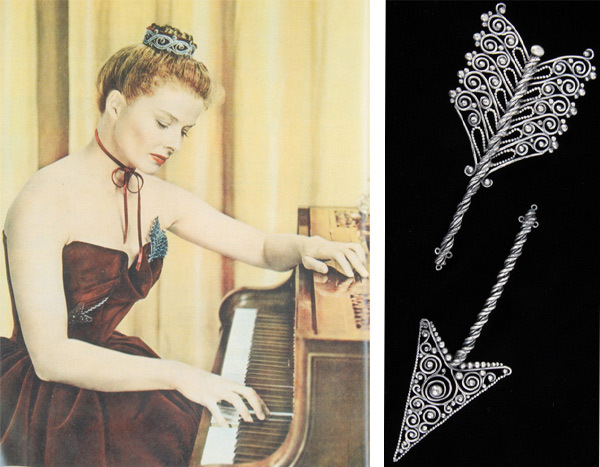 Katharine Hepburn wore this Joseff dual brooch, meant to look like an arrow going through her heart-shaped dress, in 1947’s “Sea of Grass.” The set is one of Tina Joseff’s favorites in the collection. Joseff didn’t mind the hard work. Some movies required hundreds of pieces, Tina explains. “In ‘Anna and the King of Siam,’ the king had multiple wives and 67 children, and they all had to have jewelry,” she says. In fact, 1942’s live-action “The Jungle Book” demanded Joseff provide thousands of pieces. 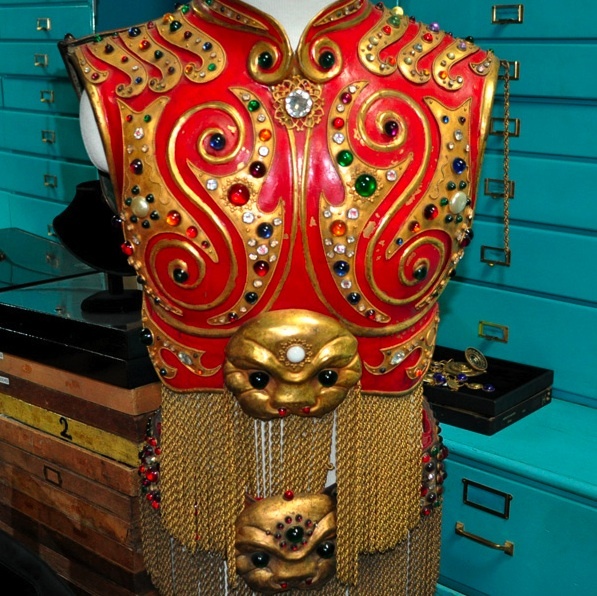 From the top of the ledge of drawers, Tina and Michele take down a large, red breastplate from “The Jungle Book,” with swirling bejeweled strips of golden metal and golden faces, and put it on the mannequin. This is from one of the sets of armor made for the three thieves in the movie. Tina says that several times a day during the filming, someone from Joseff would have to replace rhinestones that had fallen off the armor due to all the jumping and wrestling the actors had to do. 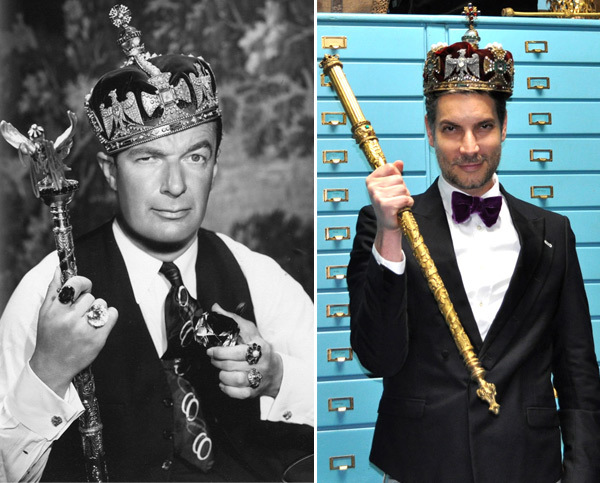 Eugene Joseff dons the crown and scepter worn by Ronald Colman in 1937’s “The Prisoner of Zenda.” Seventy-some years later, Decades Inc. co-owner Cameron Silver poses in the same crown. Cameron Silver, a big player in the current Hollywood vintage scene, says he walked in having no idea about Joseff of Hollywood—which tells you something about how out of the spotlight the company’s been in recent decades. But as the magnificent pieces come out, one by one, he gets more and more excited, and begins to bubble with ideas about how to make the company’s legacy known. Silver dons the crown and scepter worn by Ronald Coleman in 1937’s “The Prisoner of Zenda.” Amusingly enough, an old image of Eugene Joseff shows him looking regal in that very same crown. When Silver puts it on, he resembles Joseff an uncanny amount. “I’m going to call this one “Crowning Around,” Silver declares. Inspired by Silver, we decide to get a picture of all of us in crowns, everyone picking one from the stash on the ledge. Michele says to me, “Here, do you want to wear Shirley Temple’s crown?” and hands me the tiara and scepter the child star wore in 1939’s “The Little Princess.” It feels very precarious on my head. I nervously imagine it crashing to the ground, but it doesn’t. Crowns and scepters were probably the last things on Eugene Joseff’s mind when he started working in the advertising business in Chicago, where he also did an apprenticeship in an art foundry. There, he learned how to forge statuettes and other decorative items out of bronze. He left in 1928 to make his future in California, specifically, Hollywood. Thanks to his “outgoing and wild personality,” Eugene Joseff quickly fell into the movie-making crowd when he landed in Hollywood in the late 1920s. “He just was the type that attracted people to him,” says Tina, who started working for the company in 1972. The year after his move, the Great Stock Market Crash sent the economy into a devastating tailspin that left a large number of Americans broke and jobless. Fortunately for Joseff, Hollywood was the place to be during the ’30s and ’40s, when impoverished Americans found refuge in films. For a couple dimes, they could fantasize about times of wealth and glamour. Joseff’s Hollywood-insider friends, like costume designer Walter Plunkett, would take him to the movies they made or invite him to visit their movie sets. Instead of being intimidated, Joseff would loudly mock the jewelry the costumers put on the actresses. Joseff accepted this challenge, and set out to make the most historically accurate costume jewelry possible. He dug into historical books and piles of bound magazines like “Ladies Field” and “Harper’s Bazar” from the Victorian Era. He traveled, visited museums, and studied pieces from the Renaissance and ancient times in detail. At his Sunset Boulevard home in Hollywood, Joseff began experimenting with processes for making costume jewelry in his garage. With his brother Jimmy Glaser, he founded Sunset Jewelry Manufacturing. After a couple years Jimmy—who was married to Hollywood costume designer Leah Rhodes—left the company, and Eugene began to look for jewelry craftsmen to work with, while continuing to tinker on his own. 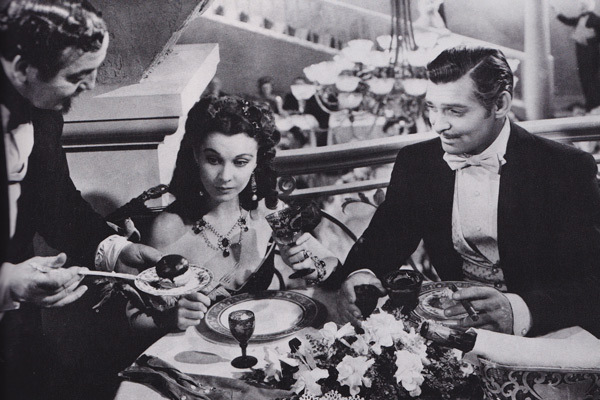 In the ’30s and ’40s, Joseff was supplying over 90 percent of the jewelry in the movies. according to Michele. 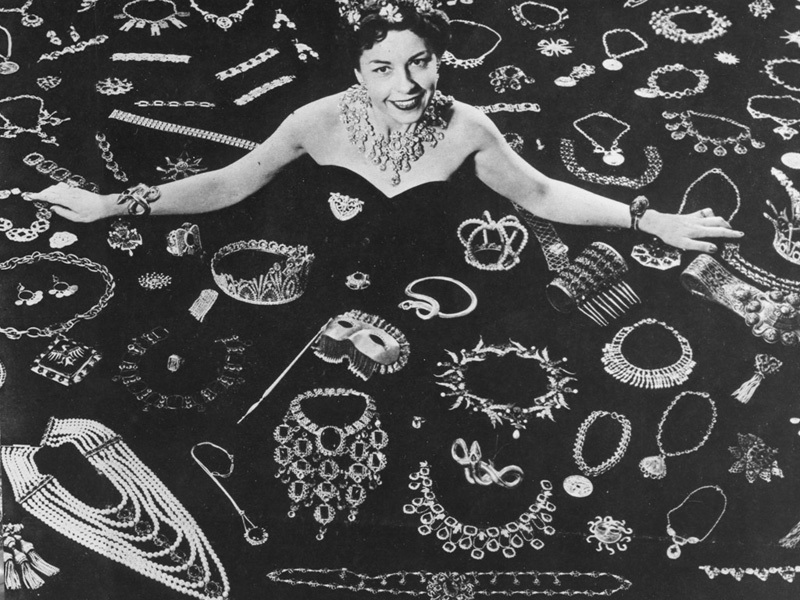 “Antiques Roadshow” appraiser Rosalie Sayyah, a costume jewelry expert who goes by the name “Rhinestone Rosie,” agrees that Joseff, who employed between 35 and 70 during his company’s peak years, made an impact on Hollywood and fashion that cannot be underestimated. Rhett Butler’s one-of-a-kind cigar case from “Gone With the Wind” will never be rented to a movie studio again. Same goes for his belt buckle and Scarlett O’Hara’s jewelry. 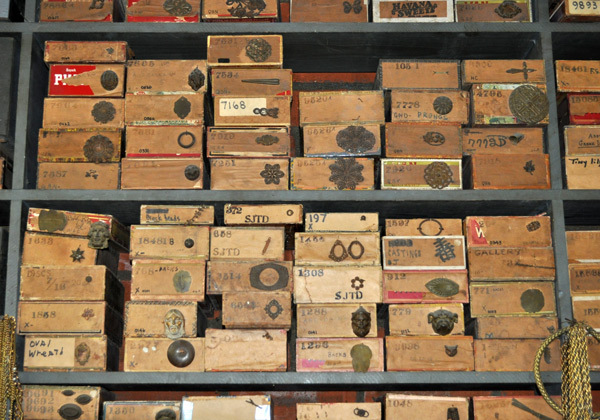 Jewelry parts are still stored in cigar boxes, as they were in Joseff’s time. The writing on the boxes has yet to be decoded, but Tina and Michele know the numbers have to do with the dealer Joseff bought his parts from and the price he paid. Click image for a larger view. The workshop where Joseff kept all of his parts and forged his famous pieces is still there, in the room behind the studio. Tina and Michele take me there next. We greet Lucy Koch, who’s been with the company for 50 years and still puts the jewelry together by hand. This room has a wall stacked floor to ceiling with old cigar boxes—the same ones used by Joseff all those years ago. They’re filled with large metal findings shaped like flowers, skulls, and animals like snakes or elephants. Small findings are kept in a card catalog, while a rainbow of Swarovski crystals are stored in clear glass jars and chains hang from the ceilings and walls. 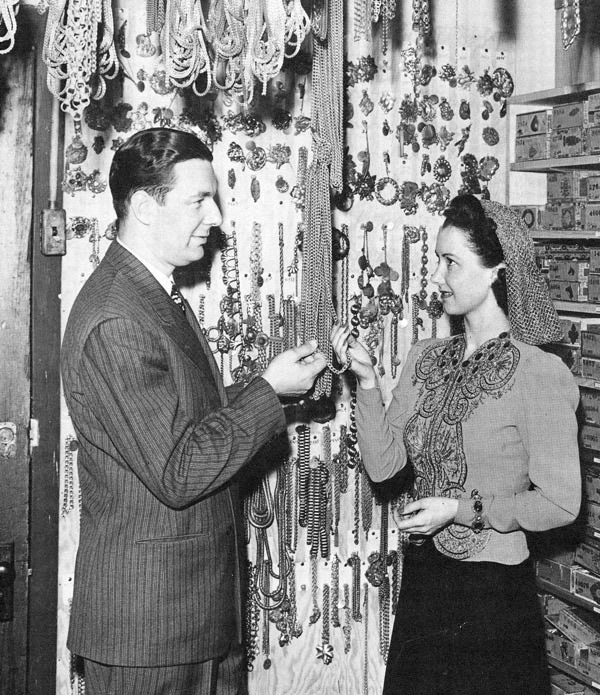 Joseff and actress Katherine Wilson look over his supply of chains. Joseff always kept plenty of chains on hand to meet emergency studio orders. The cigar boxes behind Wilson are the same ones used today. I’m shocked at the cluttered, messy state of the two work tables. As I study the jumble on a table, I find it hard to believe this is where those exotic pieces worn by Hollywood’s biggest stars were born. It’s like a woodshop, but instead of sawdust, the table is covered with glittery rhinestones, and a Bunsen burner is still aflame. 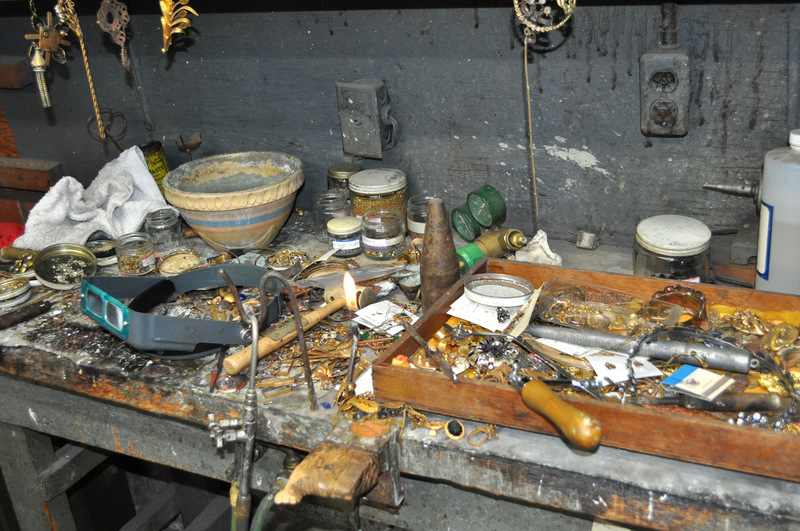 A work station where jewelry has been made for Hollywood’s biggest stars. Click image for a larger view. After we leave the studio, Tina takes me and Silver outside and then to the manufacturing plant, where Joseff’s trademark metal jewelry findings are cast. As World War II began brewing in 1939, Joseff also turned his metalworking talents toward developing techniques for manufacturing airplane parts for McDonnell Douglas, and founded Precision Investment Castings, the successful jet-parts company the Joseffs are still running today. At the same time, the Joseff of Hollywood retail and Hollywood rental businesses were flourishing. Surprisingly, the process for making airplane parts isn’t all that different from making jewelry. All the jewelry findings are cast in pot metal while the plane parts are cast in stainless steel. Tina says it doesn’t make much difference to the workers whether they’re casting jewelry or jet pieces. “It basically goes down the same assembly line,” Tina explains. 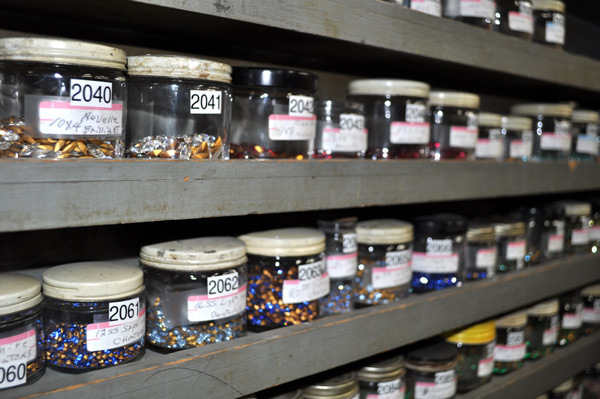 Rows of Swarovski rhinestones (Joseff uses no other) adorn the walls of the tiny Joseff workshop. One reason Joseff was so successful in Hollywood was that he developed a special plating technique known as the “antique” or “Renaissance look” that gave his jewelry a veneer of authenticity, Tina says. Even better, his pieces didn’t reflect the bright lights used during the filming. 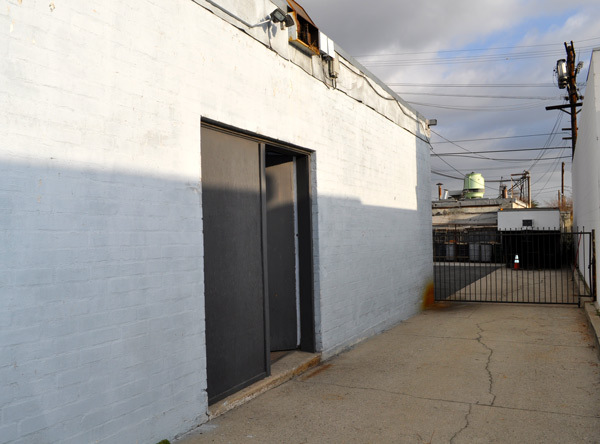 The Joseff manufacturing plant is in the small building behind the studio. This is where the pieces are cast, before they become the beautiful baubles we see onscreen. 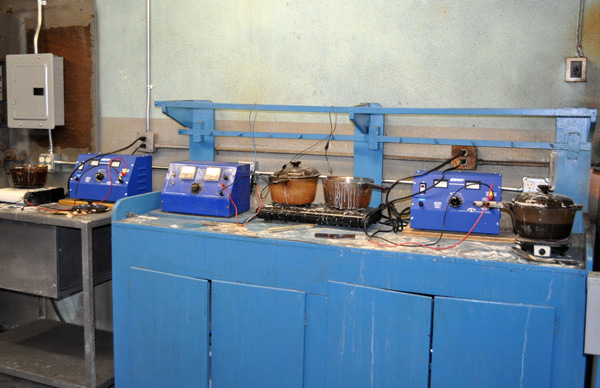 After casting, the jewelry bits are brought to the plating area. Tina points it out: This is where the Joseff magic happens. Each piece is plated with Joseff’s “secret sauce,” a recipe and technique that will forever remain a Joseff family secret. This plating sauce used to simmer in much larger pots, Tina explains. But because it involves cyanide, the company switched to these surprisingly small Pyrex dishes, the sort you’d make soup in. 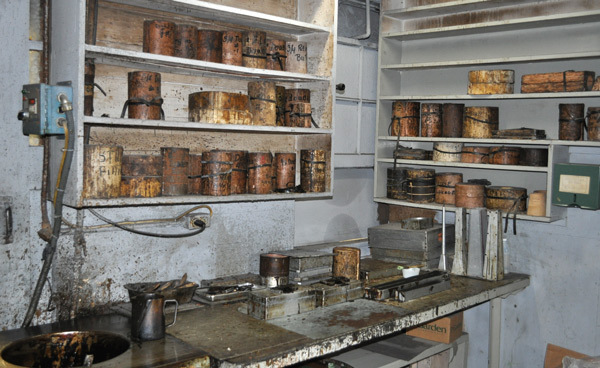 After casting, pieces are brought to the plating area. Each piece of metal is plated with Joseff’s “secret sauce,” which gives Joseff pieces their signature antique look. In addition to this “antique look,” Joseff made his period jewelry even more authentic by employing ancient setting techniques, says “Antiques Roadshow” appraiser Rosalie Sayyah. 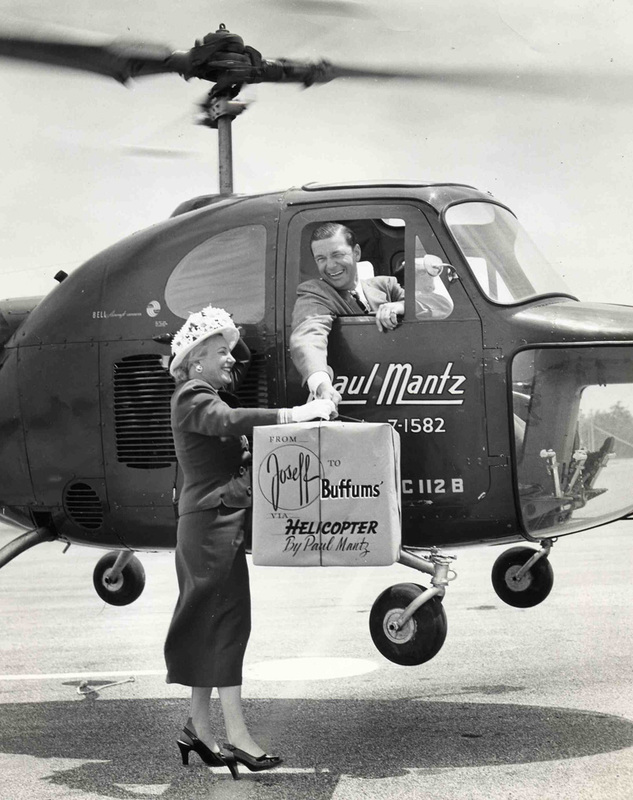 Joseff is pictured delivering his wares to Buffums department store in a newspaper ad from 1948. Thanks to his cunning and innovative approach to movie jewelry, Joseff became something of a celebrity in his own right. He went as far as to legally change his name to just Joseff. 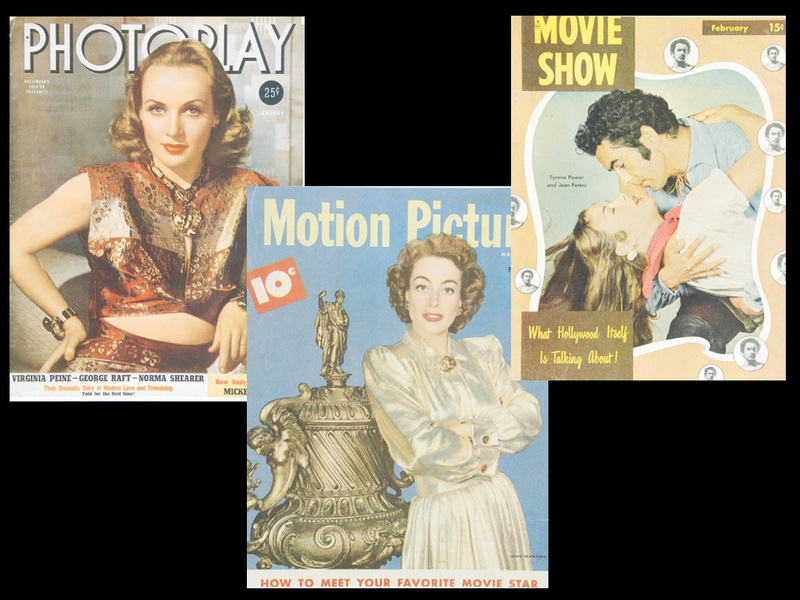 Regular women, in turn, would see photos of their favorite stars in magazines like “Coronet,” “Movie Stars Parade,” or “Movie Secrets” and covet them. And it struck Joseff, “Why shouldn’t we make every woman in the world feel like a movie star?” And so he expanded his business to retail around 1937, offering pieces for as much as $2.50, a steep price for the time. The line was sold at Nordstrom’s, Neiman Marcus, Bullock’s, Macy’s, Saks, all over. While he was great at designing the jewelry, as well as socializing and networking, Joseff found the demands of managing a retail business overwhelming. So in the late 1930s, he made a call to Sawyer’s Business College for a secretary to help him manage the retail side. The school sent a sharp business-minded young woman by the name of Joan Castle, or “J.C.,” who was also working on a Ph.D. in psychology from UCLA. 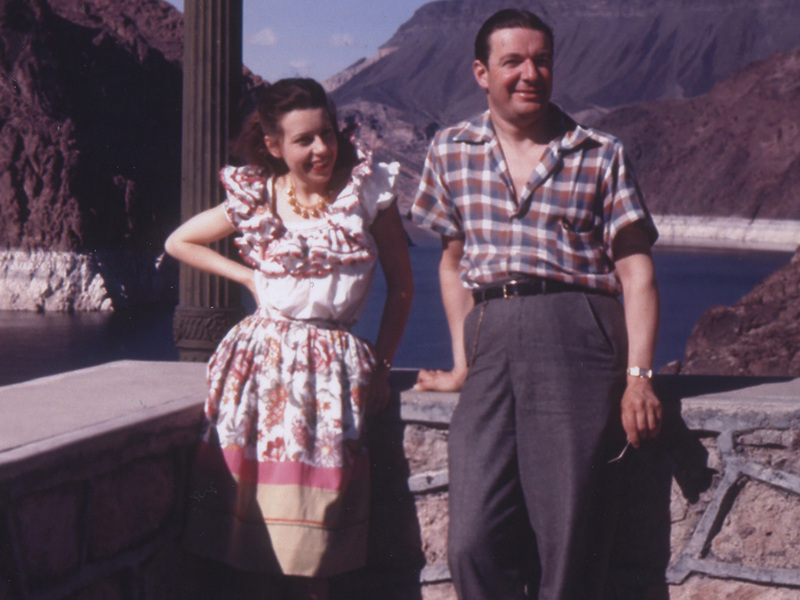 Newlyweds Joan Castle Joseff and Eugene Joseff at Lake Mead, Nevada, for their 1942 honeymoon. Joan wears the 10 bells necklace from the retail line. Unfortunately, as Joseff of Hollywood was reaching its peak in the late 1940s, tragedy struck. When he was 42 years old, flying his own plane out of Newhall, California, in 1948, Joseff crashed his aircraft, and everyone on the plane was killed. Joan, his surviving wife and partner, took over his businesses, which she stayed involved with until her death at age 97 in 2010. All three still operate out of the Burbank studio I’m visiting. Joan was a savvy businesswoman, so she recognized that tides were turning in the 1950s: As Americans became prosperous and had more access to precious metals and gemstones, regular women wanting glamour began to turn their noses up at over-the-top costume jewelry in favor of more discrete fine jewelry. In 1956, Prince Rainer III of Monaco adorned his bride, Hollywood star Grace Kelly, with a real diamond tiara and necklace by Cartier, and that seems to have snowballed into the current trend of celebrities wearing only fine jewelry on the red carpet. “In Hollywood’s Golden Age, stars would wear our necklaces and earrings to the Academy Awards, but these days they get lent the real stuff worth millions,” Michele says. 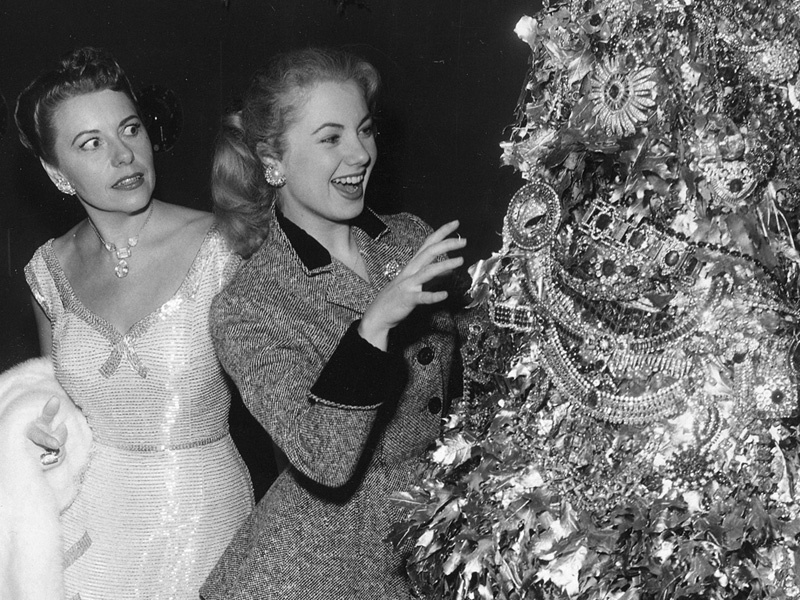 Joan Castle Joseff looks on, horrified, as Shirley Jones, who starred in many Rodgers & Hammerstein musicals, pretends to touch a Christmas tree made of Joseff jewelry during a company holiday party. As tastes changed in the 1950s, Joan adapted the retail line to focus on cute, figural brooches, which were tremendously popular. At the same time, Joseff of Hollywood was making its mark on the young medium of television, on shows like “I Love Lucy” and “Queen for a Day,” while Joan became active in the Republican Party. Meanwhile, the airplane-parts side of business, Precision Investment Castings, got a contract making military plane parts for the Korean War, employing as many as 240 people at its peak. Movie studios themselves are partially to blame for the end of Joseff’s reign. 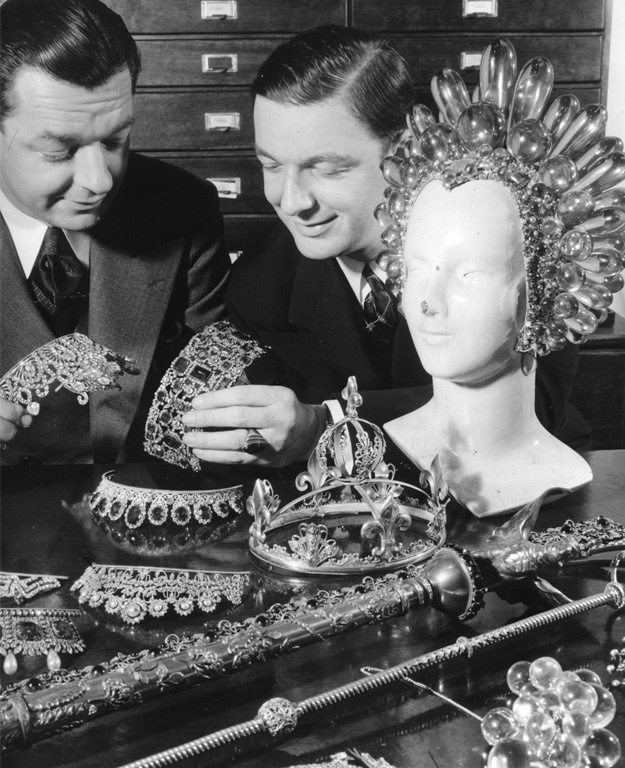 For decades, while they rented and returned Joseff pieces, the studios had also been building their own permanent costume jewelry collections. By the late ‘60s, they didn’t have to rely on Joseff as much. But the ‘70s delivered the most devastating blow to Joseff’s reign, thanks to the newfound taste for realism and naturalism in film. Suddenly, the grandiose escapism of the Golden Era was gone. However, Joan kept the companies afloat. She found a new niche for Joseff of Hollywood in ‘80s primetime soap operas like “Dallas” and “Dynasty” that reveled in ostentatious displays of wealth. As Joseff jewelry faded into obscurity, Precision Investment Castings—for airplanes and now NASA space crafts as well—thrived. 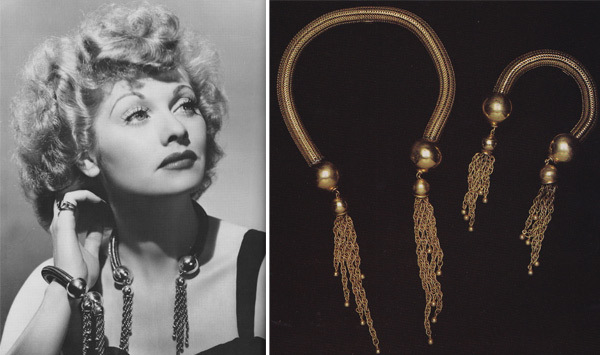 Lucille Ball wears a Joseff of Hollywood necklace and bracelet set. 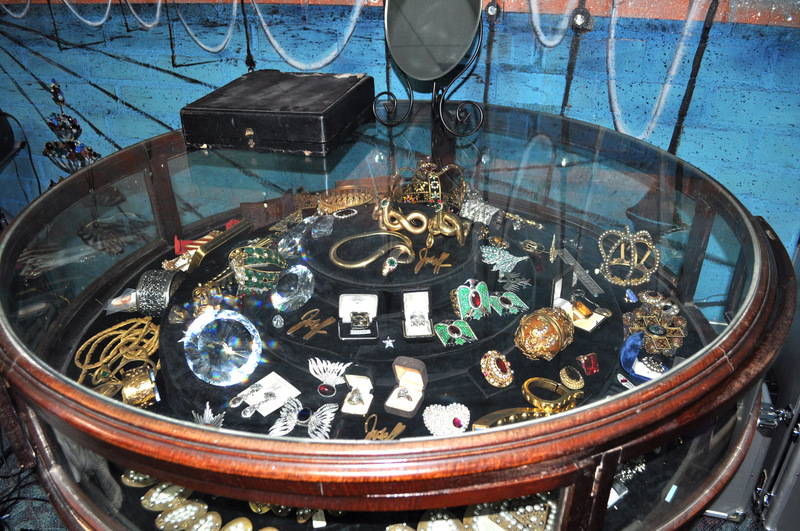 The company provided much of the jewelry seen in “I Love Lucy” and was even a plot point in an episode. Joseff of Hollywood also remains a favorite of costume jewelry fanatics, who mobbed Tina and Michele’s booth at the last Costume Jewelry Collectors International Convention and snapped up every piece of Joseff they could get their hands on. 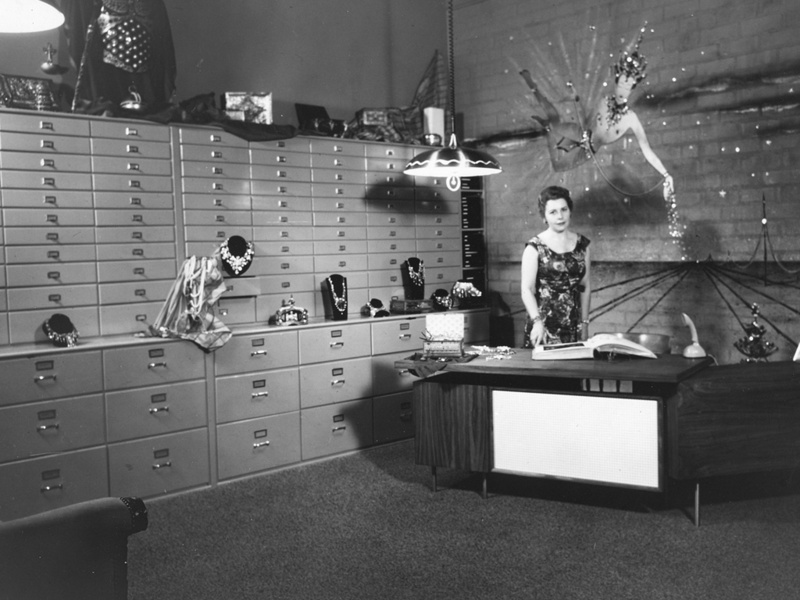 Joan shown at her desk at the Joseff of Hollywood studio in 1953. Back in the studio, Tina and Michele show me several of Koch’s latest pieces. It’s impossible to tell the difference between what’s new and what’s vintage because many pieces are made from those same vintage findings we’d seen earlier in the workshop. From the looks of the file cabinet stuffed to the gills with archives, it’s obvious that Joan also had an obsessive side, which most collectors can appreciate. There’s a file of just photos from the fabulous Christmas parties they used to throw. Not only do they have the memory, but they also have the proof. 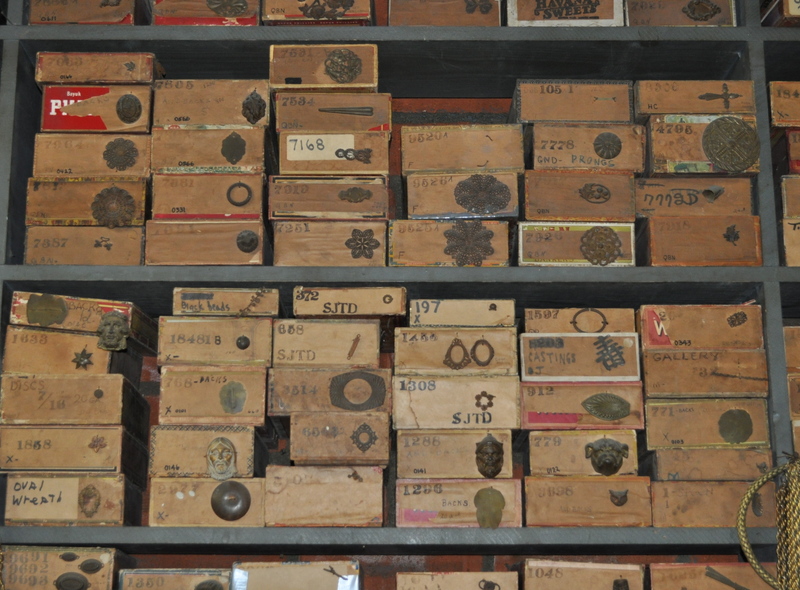 One studio wall is lined with trays of Joseff jewelry. The pieces are organized by type and by color. This is funny because the movie stills the Joseffs have to identify pieces are in black-and-white. Tina Joseff’s daughter, Michele, is currently working on photographing and archiving the whole collection to post it on the company web site, in hopes of making the studio rental process smoother, and breathing new life into the once-bustling movie rental business. That said, the Joseffs are particular about who they rent their jewelry to. Not just any Joe can walk in off the street and walk away with a historic piece of jewelry. This turquoise vault of Hollywood treasures has been meticulously preserved through half a century. But some pieces, naturally, can never be rented, because they’re irreplaceable historical film artifacts. They’ve traveled the world appearing in museum shows in Barcelona, Paris, Milan, and London, as well as the L.A. County Museum of Art, and the Academy of Motion Pictures, but they’ll never see the bright studio lights again. Which makes this visit to the hidden Joseff of Hollywood studio all the more magical. Rarely would someone like me get the chance to see—much less touch or try on—these valuable Hollywood treasures, without a personal invitation from Tina Joseff herself. Don’t even think of asking me for the address—I’ll never tell! 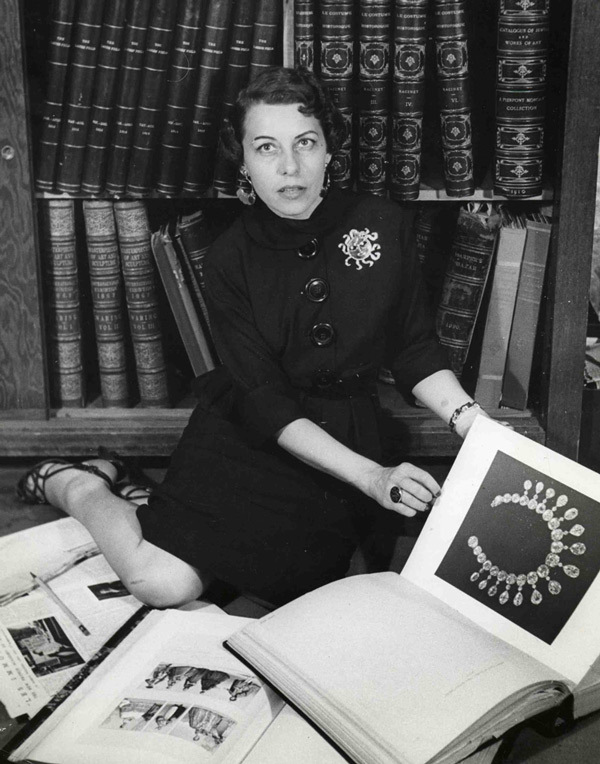 Joan poses wearing her company’s crown jewels on her voluminous skirt. Michelle……Should you ever come across a silver heart ring that says within a scroll “Everything leads me to thee” – I would do almost anything to own it again. I wore it for two years before one odd night, Mrs. Joseff noticed it and took it off my finger. It was only then that I realized Jeff must have taken it from the amazing collection of jewelry he obviously felt privy to. NOT. It was the most beautiful ring I’ve ever worn. I’ve always felt so sad about that, especially since Mrs. Joseff really cared about me…..even in her last days. Thanks Michelle. Thank you for a fantastic and fascinating article! I’m not a costume jewelry person – I primarily deal in gold & silver antique pieces – but I’m a big movie fan, and love learning about the jewelry in films! Thank you so much for this excellent article, and a rare trip into the beautiful world of exquisite Hollywood Jewelry, and it’s ‘one of a kind’ pioneer, innovator and creator of such historical movie gems! I would like to find out if Joseff made the HUGE, magnificent, “emerald green” solitare ring that Cyd Charisse wore in one of the fantasy scenes with Fred Astaire in the film “Band Wagon.” It was a stunning ring, my favorite color/stone…emerald green. I am obsessed with finding out who owns that ‘prop’ ring? Did Joseff make that particular piece, and is it in his collection? Thanks again so much! Would like to get a catalog of all Joseff jewelry. Thank you so much for this article. I hope one day, I can visit also to Joseff of Hollywood so I can personally see the collections. My uncle was a representative of Joseff of Hollywood in the early to mid-1930s. He met a young actress named Harriet Lake at Joseff’s office and dated her for a while, but she was only interested her career. She later changed her name to Ann Sothern. My mother remembers waiting in her brother’s car at the studios while he was inside their wardrobe departments. Thanks so much for creating this webpage! A wonderful insight of, behind the scenes, Hollywood glitter and glam. I have to say I am terrible about reading and keeping focused but this article you couldn’t tear me away from. That piece that Lucille Ball wore was amazing and I can see people wearing it today. I am so blessed to have stumbled onto your article..so impressed!! Thank you SO MUCH for such a riveting article. I have a fabulous necklace and earrings that are signed “Joseff.” The stones are purple and they are set with arrows pointing downward. My Mother gave this set to me 30 years ago. I don’t wear it very often but when I do, I get bombarded by women! I will take a picture of it and send it to you, maybe you can tell me a little bit about it. Thank you. This brought back memories of my mom . What a wonderful, magical era. Thank you for the story, it was wonderful!! I found this absolutely engaging article because I googled “game piece jewelry”! I read it non-stop as it has everything my dreams are made of: jewelry, history, film, cigar boxes, shelves and drawers (in turquoise for crying out loud), rhinestones, jewelry trays, findings, card catalogs, a tree made of costume jewelry, creative studios, warehouses (chock full of jewelry), and best of all , my vintage man crush – Tyrone Power. Thanks for opening up my little world to the legacy of Joseff jewelry. If the collection were made into a catalog, it would be a best seller. Just an incredible story full of details and history of the incredible creative and visionary artist Joseff. Thank you for sharing this with those of us who sell, collect, and wear pieces from the past… today and for years to come. This would make a great book or Movie. I have just come across this website and am absolutely blown away by all the information and fantastic stories especially this article on Joseff jewellery. Now I have to find time to read all the other articles. Thank you for such an informative and entertaining article about one of my passions…. 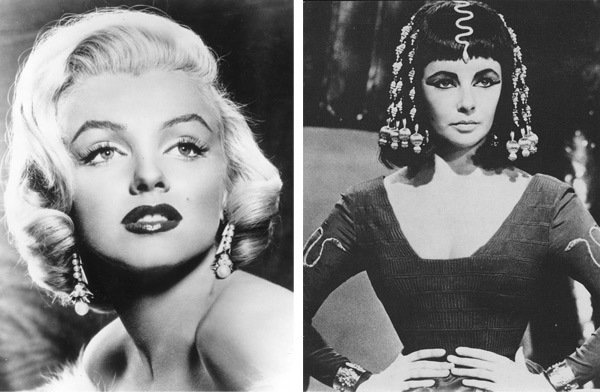 the Golden Age of Hollywood…and it’s jewelry!!! spending time with the Joseff’s and their never to be duplicated legacy….was a wonderful step back into time, How I envy your trip back in the ‘time machine.’ Please keep us updated on the Joseff’s…..and please suggest to them a possible tour open to the (paying) public….I think there would be fantastic support from the (paying) public to be able to see this spectacular representation of what we’ve seen on the Silver Screen. This must be where heaven is. Fabulous read and a real insight to what he and his team were doing. Amazing article! I loved reading it. I own earrings and a bracelet given to me by a former worker who lived in Glendale around 1987, and I treasure it. It still looks brand new. I have long- admired the Joseff style – so prolific in its form. I stumbled upon a book about him in 1998 in a San Diego used bookstore entitled, “Joseff: Jeweler to the Stars.” Later that same week, oddly enough, I stumbled upon a signed Joan Castle piece I. A thrift store! The crown pendant which she designed as a promotional piece for the the -popular radio show, Queen for a Day (which was later televised.). The crown pendant has an aged patina but the Joan Castle insignia is clear. I find everything about this couple and their era fascinating. A more graceful time aesthetically speaking. Fantastic article! Thanks for taking us on this special tour. 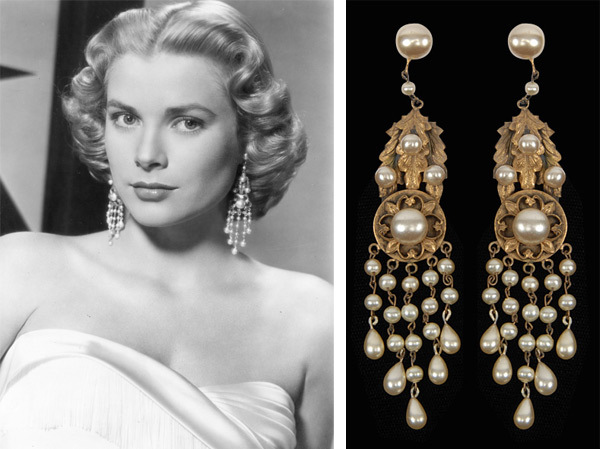 Just curious….Do you know if Joseff’s of Hollywood, designed the one of a kind 6-strand pearl and gold bead bracelet with the 6 over sized gold charms attached to each bracelet; worn by Grace Kelly in Alfred Hitchcock’s…”Rear Window?” I read that the large gold charms were the property of Edith Head….and that she had Joseff’s put the bracelet together. It is my absolute favorite….and I have duplicated my own embellished version of that iconic treasure. Thank You. Engaging and well-researched article about a fascinating subject, even if the title is a red herring. Although the museum professional in me is horrified to see people actually touching and wearing pieces of film history like that. Nice to know that some of the more influential pieces are loaned to museums for exhibit though! On May 5 2014 my cousin Robyn O’Neill wrote a comment on this page. Unfortunately she has passed and by chance I found this article because in her estate there are some costume jewelry pieces and they maybe samples from Joseff, because my dad was the sales rep.
Is it possible, probably not, to visit the warehouse and to see what my dad experienced. It would be great if they could do a temporary exhibit (like the one at SFO) at the Legions of Honor building in San Francisco. I know I wouldn’t mind paying just to get a glimpse of these treasures! It’s a shame to keep them hidden. Thank you.